THE place to settle disputes. Best COD4 map, brah. Review by The General on 9/30/2014. Review by okasan on 9/16/2014. The map _looks_ balanced, but is in fact heavily biased towards the starting position at the Northeast corner (1v1 against AI: start NE, 11 moves, start SW 19 moves to win, based on four quick playthroughs). One quick-fix solution could be to just swap the reward for the two middle bonuses (give 5 for the bottom one and 3 for the top one). Game play is also very linear, with no variation of the battle order. Suggestion: since you got sniper positions, make them connected to some far away territory to create a choke point. Good start to a hopefully successful map creation career! I have sent version 1.1 in for review already, which upped the bonuses to #territories - 1. But that's a cool idea and I might spend some time thinking about that, but the problem is that would mean the connected spots to the sniper (those noobs being sniped) would be able to take the sniping spot, and I don't know if i want that. i was planning on a "hacked" version of the map that would allow "clipping" through walls and such. thanks for the review and the time you took to examine it. 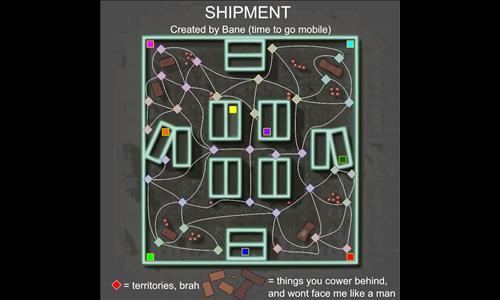 This map is good for a 1v1, and yes, it could be used to settle disputes. This map isn't my favourite, but it is satisfactory. However, it looks as though with this as your first map, you will create great maps. Keep it up! Review by Vole on 12/11/2014. Quick map for two. Starting positions may weigh on the result quite heavily. Review by Nathan on 9/15/2014. Cute, but fairly imbalanced. The bonuses don't make any sense and starting position is pretty much outcome-determinative. any suggestions? im new at this. Review by King C******* V on 9/21/2014. I BEAT KIM JONG LITTLE BILL ON THIS MAP! thanks for a well thought out, poignant review.